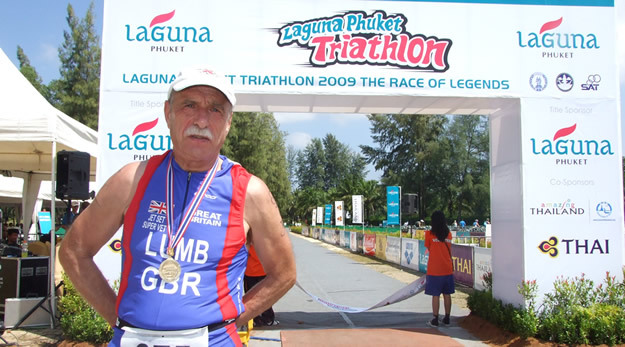 One again Stuart Lumb - aka Jet Set Super Vet - has been living up to his name, and ended his 2009 season by swapping the cold of Yorkshire for the heat and paradise of Thailand for the Laguna Phuket Triathlon. Standing on the steps with the snow swirling round, waiting to board my much delayed flight from Paris to Leeds, the hot sun and blue skies of Thailand seemed a very distant memory – in fact it was only three weeks ago that I'd been slogging round as a competitor in “The Race of Legends”. I'd fancied having a bash for a while and registered back in the summer hoping my fitness would be ok in December. It's hard work keeping the training going through the autumn plus cold, short days don't help. Open water training is not an option - for me anyway - but my gym has a 20m pool so I was ok there. Another hazard I have to contend with travelling so much is plane ‘flu . I picked up a head cold in November during a Malaysia trip but fortunately it didn't last long. Curtailed my swim training though. I thought my long – suffering heel would be bothering me but I pulled a hamstring as a result of an over zealous fartlek session so my “running” got restricted yet again. Anyway, in late November out came the bike box and I set to and stripped down my bike. They say mishaps go in threes….I always undo my hanger to stop it getting bent even though I have a very solid glass fibre box. BTW – DON'T do this with your bike on its saddle as tiny bolts can disappear down down tubes very easily!! Fortunately my long suffering race manager Mrs JSSV was in Hull that very afternoon and stopped off at Cliff Pratt Cycles who very kindly robbed a brand new Giant to find me those all important bolts. Ian, who owns the business also gave me a slug of TORQ gels and Nuun re-hydration tablets bless his cotton socks. Mishap no. 2 - after my wife got home I suddenly noticed I had only one spare inner tube. I always carry two so I said to her let's hope there's a bike shop near our Thai hotel. Another note: Have a pre-race check list and USE it! Mishap no. 3 was actually a tragic accident. We took the train from East Yorkshire to King's Cross en-route to Heathrow and always allow a good few hours safety margin. Just outside Peterborough the train ground to a halt and after about 10 minutes were told that some poor soul had committed suicide, jumping into the path of an on-coming train... Naturally the whole main East Line was at a standstill. Time was ebbing away and we finally got to King's Cross two hours late. We fought our way out through the crowds to the taxi rank and clambered aboard a black cab with another Bangkok-bound traveller. The normal 45 minute trip actually took nearer 90 minutes but the cab did at least take us right into the Terminal forecourt. I hate to think what my heart rate got to - much higher than in my toughest race! My box has wheels so we “rocketed” into the check-in area – with five minutes to spare. Ironically the flight left half an hour late, but at least we were on it! We were flying with Thai Airways, who gave competitors an extra 10kg luggage allowance FOC. Our hotel was one of several which comprise the Laguna Phuket resort complex, some 30 minutes drive from Phuket airport. Once settled in the hotel staff kindly found me a local bike shop and I purchased a couple of inner tubes, ironically made in Italy. The organisers arrange two bike recces with police escorts and I went round with a bunch of friendly Swiss athletes, who had left home in the snow. There were a couple of stiff climbs and as I hit the first one I rued not bringing my Kinesis Motobecane which has a granny ring. My Giant Composite 1 is lighter though so a case of swings and roundabouts. At registration there was the usual scrum to see who everyone was racing against. I saw that a certain John Clarke of Sheffield Tri was in my age group - delighted to meet him again but saddened as he can give me 30minutes any day, despite the fact that he's four if not five years older than me. For some strange reason the organisers lump all the 65 and older men together and all the 50 plus women. It seems penny pinching to me if it's just done to save giving out a few extra trophies. 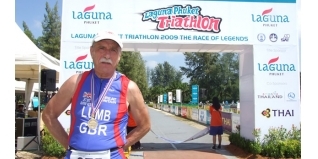 There was a 75 year old Aussie finisher and he merited an award and a moment of fame on the podium, for sure. I appreciate there were only a handful of athletes in those age groups, but my view is that if you can still race at that age it merits recognition – I wonder how many of the organising committee actually race and how many of them will be racing in their 70s? It was even worse for the women as Edwina Brocklesby was racing against women 10 years younger than herself. Anyway, in Dec 2010 there will be an Ironman 70.3 event and they at least will keep to the 5 year grouping regardless of age. The race started at 7am, so it was relatively cool. The swim was in two parts, a sea swim of 1.2km followed by a 100m dash and a 600m lagoon swim to T1. I had opted to wear my tinted mask and thought I had it wrong – yet again – as it was overcast at the start. However, the final sea leg faced due east and I was practically blinded by the rising run so my decision was vindicated. We had been warned to watch out for jellyfish and I saw quite a big one below me as I swam along, but fortunately I didn't get stung. 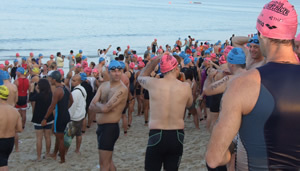 The organisers, with their TV coverage in mind, don't allow a buoyancy second skin as they like to see competitors race in their colourful trisuits. 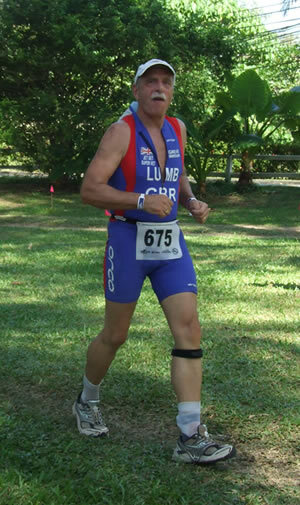 I opted for my now illegal GB two piece outfit, the one that has the GB FLAG on it… The sea swim went ok buoyancy-wise, but the lagoon swim was tough as it was fresh water and seemed to go on forever. The run was 2 x 6km and flat. The circuit wound round the resort and in fact I ran past my hotel on several occasions. Aid stations were plentiful with loads of very welcome sponges and ice water which I gratefully made use of. My run felt to be going quite well, that was until I came into T2 to start my second lap when I saw John Clarke finishing!! Anyway, I plodded on and duly finished, in just over five hours, gleefully clutching my cherished medal, another to add to my growing collection! The race was very well organised and even quite enjoyable, dare I say, apart from the “close encounter” on the dual carriageway. The awards ceremony and banquet went well, my previous comments not withstanding. Edwina Brocklesby and John Clarke both merited an award not to mention our Ozzie friend. Hopefully this will be rectified for next year. Many of the podium finishers were British nationals, but I suspect quite a few are ex-pats based in Asia. Roughly a quarter of the entrants were from Hong Kong, where two clubs are fierce rivals. I was quite surprised that my run ranking was better than my swim, but put that down to not having my neoprene crutch to swim in. There were 706 finishers with 24 DNFs and I was pleased to see my bike split ranking was 660th. Well, I'm now having a little Christmas / New Year training break but will be back in the gym before long. 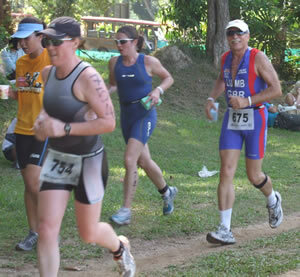 Got quite a few races lined up for 2010, so I just hope my body holds together . So, to all you anoraks who have nothing better to do than read my Grimm's Fairy Tales - thanks a lot - and may I wish you one and all, a healthy, injury –free, enjoyable and successful season's racing in 2010!